The first BuckoFlower was written in 1982 on an Atari 800. I ported it to Windows 3.1 Turbo C in 1991. Recompiled for 32 bits January 1998. The ability to specify radii that are harmonics of each other. This gives a harmonius look to the flowers. Unzip it into your C:\WINDOWS directory (or C:\WinNT) Select BuckoFlower to be your screen saver. 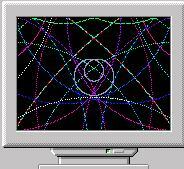 Since BuckoFlower runs as a screen saver, you can't specify the individual radii of the circles. You can give hints to the program about what shape Flowers to draw.